Jenna is an honest and calming teacher. She offers a great mix of personal insight and yoga teachings, and makes me feel like I've pushed myself to a limit that is right for each day. I enjoy her steady cadence and that she doesn't take herself too seriously- or allow us to. 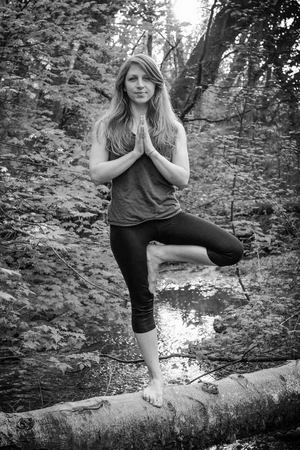 -Alisha F.
Yoga doesn't have to be competitive, or serious, or only for amazingly flexible people. It's for you, if you want it to be. Jenna's classes bring intention and humor into my yoga practice. Whether you're there for meditation through movement, stress relief, stretching sore muscles, or just to get a mini workout - it's a space where you can do all of that. I always seem to have one injury or another and require modification and I feel completely comfortable doing that in this class. It's super chill. I find that I laugh and smile in her classes. I would recommend Jenna's classes to anyone looking for some thoughtful movement. Jenna is awesome. -Stephanie R.
I appreciate how Jenna's classes are built around different tenants that inspire self-reflection, challenge, and acceptance as you move through different flows, postures, and balances. -Renatta C.
My studio classes incorporate the YogaWorks method of thoughtful sequencing, safe alignment, and fluid movement. I bring humor, lightness, and a sense of dance to my class, and encourage students to explore their own practice with an open heart. Check Kula schedule for updates! iRest provides you with tools to help you relax deeply, release stress, increase resiliency, improve your inter-personal relationships and provide you with greater mastery and control in your life. A one-on-one practice can be a deeply opening experience. For a private yoga session, I focus on the individual and tailor each meeting to your needs. If you are working through injury, insecurity, or simply looking for a personalized yogic journey, I would be honored to walk that path with you. Trained and experienced in Pre and Postnatal Yoga, I am happy to support people on their journey through pregnancy, labor, and motherhood. I found my own yoga practice to be a constant help during such special times and want to help others feel the same confidence and ease that I experienced. I am also available as a meditation coach available for private sessions.